Sparkling conversation and joyful laughter; the soft clinking of bubbling champagne flutes accompanied by classic tunes performed with grace and style… nothing sets the tone of sophistication and elegance at a cocktail party or small reception like a swingin’ jazz piano trio. With a core instrumentation of grand piano, acoustic bass, and a small drum kit, a jazz trio provides the color and vibrancy to complement a festive occasion at a volume your guests will find conducive to conversation. For cocktail music, The Steve Edwards Orchestra presents the most accomplished and in-demand studio and recording artists customized for your event performing jazz standards and popular songs beloved by all generations. Guaranteed to set a memorable tone for your party right away and put your guests “In the Mood” for the excitement to come throughout the evening. You’ve experienced the tastings, decided on the menu, paired the wines… now let The Steve Edwards Orchestra transport you and your guests to an unforgettable dining experience. Retaining the core musicians (piano, acoustic bass, and drums) from your cocktail reception and adding the luxuriant romance of three beautiful violins assures a seamless transition from mingling to dining in style. Adept at providing engaging and unobtrusive musical accompaniment during dinner, The Steve Edwards Orchestra can further customize your event by complementing presentations, toasts, ceremonies, and announcements. Attendees from every generation will be delighted with beautiful instrumental versions of familiar songs by such beloved artists as Sinatra, Stevie Wonder, and The Beatles, as well as contemporary favorites by Diana Krall, Sting, and Norah Jones. Timeless jazz standards, latin, bossa nova, and classic movie themes create a relaxed environment for conversing and dining. 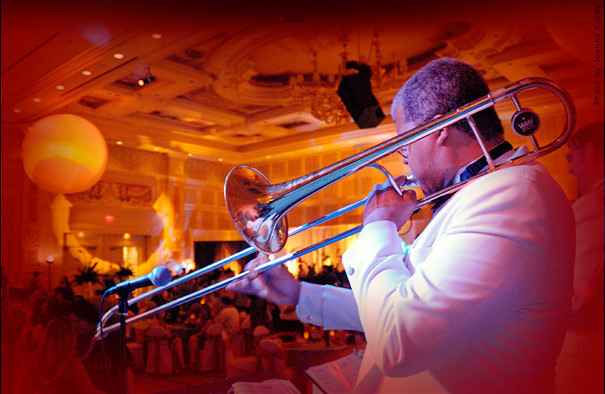 The Steve Edwards Orchestra provides many options for customizing performances to realize the vision of corporate, charity gala, and wedding clientsincluding available options for dancing between courses and utilizing the full instrumentation of The Steve Edwards Orchestra during dinner music. Allow yourself to enjoy a beautiful evening while The Steve Edwards Orchestra creates the perfect ambianceenchanting your guests and accompanying their conversation in an atmosphere of elegance. The Steve Edwards Orchestra has built its reputation on providing clients and their guests with exceptional dance sets that are festive and fun, creating a party that exceeds their wildest dreams! Playing extraordinary dance music is the best Chicago wedding band doing what they do best: performing an extensive repertoire personally customized for your celebration that’s certain to get friends and family of all ages dancing and having the time of their lives. An ensemble comprised of the most talented musicians in Chicago under the direction of Steve Edwards, intuitively reading the crowd and guiding the party with energy, style, and enthusiasm while rocking the dance floor late into the night. Whether you are entertaining 50 friends or 5,000 guests, the Steve Edwards Orchestra guarantees that the dance floor will be packed from beginning to end. Throw a party that sizzles! Let The Steve Edwards Orchestra get your guests out of their chairs and onto the dance floor with an unforgettable night of music and joyful memories to last a lifetime. Your wedding ceremony deserves the finest musical accompaniment, and you've found the perfect partner in realizing your dreams for the big day with The Steve Edwards Orchestra. So whether you're joining your beloved under the chuppah or planning a destination wedding on the beach; walking down the aisle of a grand cathedral or tying the knot at an intimate outdoor garden, the Steve Edwards Orchestra has over 20 years of experience providing unforgettable brides with unforgettable memories. Few things more perfectly define understated elegance like a beautiful string quartet welcoming guests for the prelude, underscoring the ceremony, and joyously accompanying your recessional. This four-piece ensemble guarantees the perfect volume for indoor and outdoor ceremonies and provides a lively and gracious accompaniment for weddings of any size. Trumpets heralding the bride's arrival and providing a joyous fanfare following your special kiss and first presentation as a couple are quite simply the icing on the cake. A grand entrance accompanied by this popular option makes a statement guaranteed to increase the "oohs and ahs" you hear as you walk down the aisle. Charming, graceful, sophisticated: set a lovely tone for your ceremony with the tasteful beauty of this exquisite instrument. What could be more fitting on the day you embark on the ultimate duet than a romantic guitar duo? As a renown classical guitarist, Steve Edwards takes pride in offering this fresh option to personalize your wedding ceremony with beautiful classical music. Spanish flair lends a touch of the unexpected sure to delight your guests. At the Steve Edwards Orchestra, we believe your Chicago wedding should be a unique reflection of the love you've found and we look forward to helping you personalize the perfect music for your wedding ceremony.